I feel I should preface this post with, no, I am not pregnant. I’m not sure if there is some natural progression of hormonal overhaul that happens when you reach your mid-twenties, but even on days when my feelings ought to be in-check, I find myself fighting back tears over things that generally should not register on my emotional radar. When I was a teenager and still living at home, I remember my mother crying at the drop of a hat. She would sob over 60 second commercials for Cottonelle toilet tissue. Talk shows made her weep. Ordinary situations generated uncontrollable hysteria. I might be exaggerating, but I remember countless occasions my dad and I would look over from our respective spots on the sofa and ask, heads cocked, “Are you crying right now?” Then we would laugh at her. And now I understand. I watch YouTube videos with cute animals and tears automatically happen. If I see a sentimental holiday commercial, anything related to the Armed Forces/Law Enforcement, or commemorative episodes on TV, wouldn’t you know it…tears abound! It is as if anything remotely heartfelt triggers some sort of inherent sob gene in my DNA (are some people predisposed to irrational emotions? ), and I become this bawling shell of my former self, inconsolable and unable to contain my passion, all the while Mike sits beside me chuckling. I guess heart strings are made to be tugged. This post has a point, and as the title suggests, it is football related. All of the aforementioned situations seem understandable, albeit somewhat silly (I mean, I once cried after watching an insurance commercial). But when, if ever, is it okay to be emotional about Football? And I’m not talking the fervent and devoted behavior typical of football fandom. I’m referring to a sentimental connection to the players, the stadium, the atmosphere…a sensation that arouses pride and makes me want to cry happy, sad, and grief tears all at the same time. Admitting this may get me admitted to Amanda Bynes’ wing of the psych ward. I just really love my school and my team. Watching our pre-game ritual on TV, knowing how loud the stadium gets right before Osceola and Renegade appear, with 83,000 people on their feet as our mascot plants the spear mid field, and I am a mess before the game even starts. 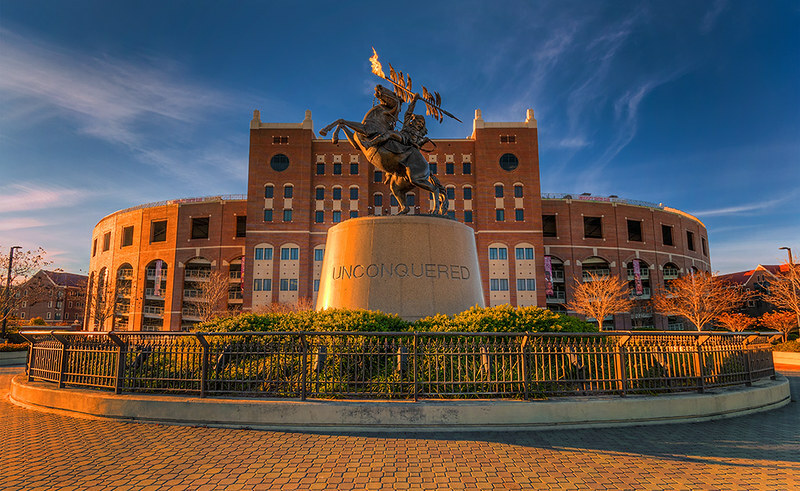 Then there are the traditions – the Warchant, fight song, tomahawk chop, the ditty we sing on first down, the punt ritual, and fourth quarter customs. I guess it’s called team spirit, but I feel like I’ve been injected with an unsafe concentration of it. And now that we are ranked #2 in the BCS standings, it’s like I’ve got a sixth sense, some emotional extremity – I need my team to do well. I can’t even read articles on ESPN about our players without crying. They all have such storied pasts – unique upbringings and strong personalities, most of which may be lost in hyperbole for the sake of the media monster, but still. I want to know them, even the bad eggs, and I want them to do well, not only on the field, but in school and in life. I want to bake them cookies and give them hugs. In college, it was rare for me to be in the stadium for kick-off. There were tailgates to attend. But on the few times I was early, it was always an emotional experience. I haven’t been back to Tallahassee in two years, but I still carry some part of that place with me, and when I watch the Seminoles play football, when I read about a player who defied the odds and excels both athletically and academically, when I see other cars around town with FSU vanity plates, I feel it. Deeply.